So how was the weekend ? Trust me I have been cursing the extreme cold delhi winter because and fog lately . Now that January is about to bid good bye and spring is almost ready to arrive , I am becoming nostalgic . I wish this lovely winter stayed a little longer . 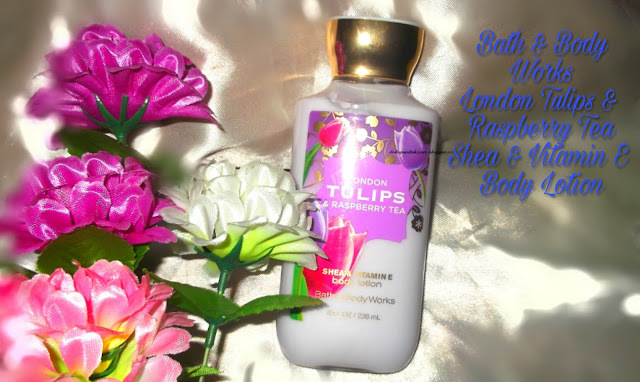 Today I am going to tell you all about a body lotion that kept my skin happy even in delhi’s cold and kolkata’s gloomy winter.I have always been a fan of Bath & Body Works products and today is and going to tell you about their London Tulips & Raspberry Tea,Shea & Vita E body lotion . It comes in a not so sleek cute looking trasparent bottle provided with a press one side and slide the opening type of cap . I find it very very hyegenic . The cap has got a balance see-saw sort of cap opening which is a lot like pressing a switch from switch board. Once you press the back side the front one opens and you see the place from where the lotion will come out . Now you need to squeeze or tilt the bottle and you get desired quantity . In India we do not get original tulips much , therefore I cannot say if it smells like tulip much . I would say it smells a lot fruity , this particular thing is common about Bath & Body Works Lotions I have used so far . The texture is non-greasy , and very very moisturizing . I actually love not so over-powering smell while a lovely scent is the purest form of love. The texture is not runny like many moisturizing body lotions I have used so far but , I must say this lotion moisturize dry skin so good that the moisture is locked for good 10 hours . So after bathing this lotion is what I am going to use . One more thing I have tried , you girls can also try it , if you are into shaving your legs with razors , trust me if you use this lotion after rinsing ,you skin feels much better than any thing else . It will provide you good protection against razor bumps becoming hard to tackle . If you are currently thinking that it is absolutely a product that works great on female skin only, then I must say my dad tried using this lotion on my recommendation and he says it made his dry elbow skin feel moisturized and nourished . So this fruity smelling lotion is powerful enough to show it’s effect on tough male skin too. Oh!! I forgot to mention my father’s skin type is absolutely dry , so it definitely will work for the purpose of moisturizing . Texture and cosistensy is not at all runny. Bath & Body work products were never on pocket friendly side , other than that no other cons ,could’ny find any .